Paulinho da Viola, Aracy de Almeida, Albino Pinheiro, Carlos Cachaça, Cartola, and Clementina de Jesus. On December 7, 1980, a week after Cartola passed away in Rio de Janeiro, the Brazilian TV program Fantástico aired footage from 1977 in which Cartola said he would like to be remembered, “years and years later,” by the song “Acontece.” (This YouTube video shows Fantastico’s homage to Cartola, which includes Paulinho da Viola singing “Acontece” with Cartola by his side in 1977, and a group of Rio de Janeiro’s most beloved sambistas singing him “Samba for Cartola” in 1979.) Acontece was also the name Cartola gave to his first round of solo performances, which were at Rio’s Teatro da Galeria in 1978 — just two years before his death. Immediately after Deolinda’s death, Cartola went on composing. He wrote “Rolam meus olhos” and “Sim” in response to her passing, and for Carnaval 1948 composed the samba-enredo “Vale São Francisco” with his friend and partner Carlos Cachaça. That was the last samba-enredo the two composed together, and the last Carnaval that Cartola marched with Mangueira samba school to a song he’d written. Mangueira’s new president, Hermes Rodrigues, didn’t like Cartola; Cartola became frustrated, and had a falling out with the school he had founded. Shortly after, he disappeared from Mangueira. Cartola and Zica pictured in the window of the home they built together in Mangueira. Fortunately, Zica — a lifetime acquaintance from Mangueira, and sister of Carlos Cachaça’s wife, Menina — fell in love with Cartola even at this low point in his life. In 1953 she went to live with him in Manilha for a couple of months, and then brought him back to Mangueira. She encouraged Cartola to continue composing and playing guitar. Still, Cartola maintained a low profile, until one fortuitous night in 1956 when he was rediscovered by the journalist Sérgio Porto at a café in Ipanema. Cartola was working nightshifts at an Ipanema carwash, and went to have a quick drink at the café; Porto spotted him and grew ecstatic. Porto and his friends, enamored of the samba master they referred to as “the Divine One” (“o Divino”), quickly reintroduced Cartola to Rio’s samba circuit, where he remained a central figure until his death in 1980. 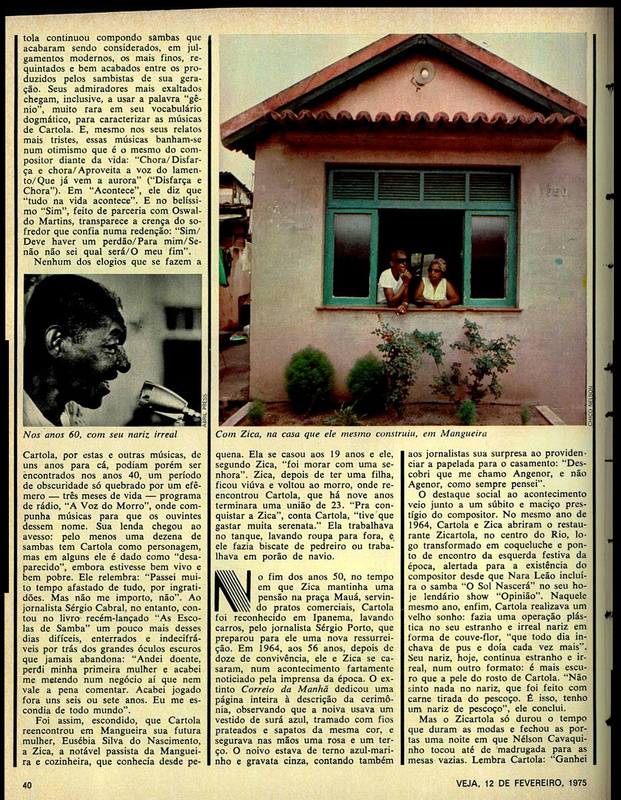 Cartola and Zica in the home they built together in Mangueira, with a rose bush in the garden. Cartola was inspired by his poetic response and wrote one of his greatest successes as a “birthday present” to himself, a few days before his sixty-seventh birthday. Although he was a popular sambista since his youth, Cartola never achieved much commercial or financial success, and only recorded his first LP in 1974, at age sixty-five. He said he had been losing motivation – seeing everyone around him recording LPs – and couldn’t even believe he had finally recorded a disk until he held it in his hands. Moved by the achievement, he eagerly went back to composing and came out with his second LP, with “As Rosas Não Falam,” in 1976. The main source for this post was Cartola: Os Tempos Idos, by Marília Barboza da Silva and Arthur de Oliveira Filho.